What does the El Nino really mean? The Bureau of Meteorology (BOM) has declared El Niño, but what does this really mean? This great infographic (see below) explains what typically occurs in an El Niño year. For northern producers, it could mean a late start to the wet season in 2015 -16. So now is a really good time to ensure that your forage budgets and dry season management plans are up to date. Contact your local FutureBeef team if you require assistance. 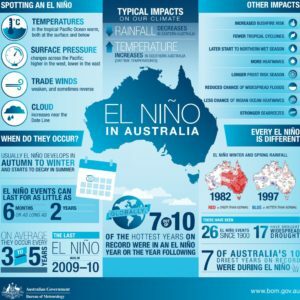 You can find out more about the El Niño status on the BOM website.